The New York Times has a report today based on a 2,000 page Army investigative report on prisoner abuses at the Bagram Collection Point in Afghanistan back in late 2002. Even as the young Afghan man was dying before them, his American jailers continued to torment him. The prisoner, a slight, 22-year-old taxi driver known only as Dilawar, was hauled from his cell at the detention center in Bagram, Afghanistan, at around 2 a.m. to answer questions about a rocket attack on an American base. When he arrived in the interrogation room, an interpreter who was present said, his legs were bouncing uncontrollably in the plastic chair and his hands were numb. He had been chained by the wrists to the top of his cell for much of the previous four days. Mr. Dilawar asked for a drink of water, and one of the two interrogators, Specialist Joshua R. Claus, 21, picked up a large plastic bottle. But first he punched a hole in the bottom, the interpreter said, so as the prisoner fumbled weakly with the cap, the water poured out over his orange prison scrubs. The soldier then grabbed the bottle back and began squirting the water forcefully into Mr. Dilawar's face. "Come on, drink!" the interpreter said Specialist Claus had shouted, as the prisoner gagged on the spray. "Drink!" At the interrogators' behest, a guard tried to force the young man to his knees. But his legs, which had been pummeled by guards for several days, could no longer bend. An interrogator told Mr. Dilawar that he could see a doctor after they finished with him. When he was finally sent back to his cell, though, the guards were instructed only to chain the prisoner back to the ceiling. "Leave him up," one of the guards quoted Specialist Claus as saying. Several hours passed before an emergency room doctor finally saw Mr. Dilawar. By then he was dead, his body beginning to stiffen. It would be many months before Army investigators learned a final horrific detail: Most of the interrogators had believed Mr. Dilawar was an innocent man who simply drove his taxi past the American base at the wrong time. When I hear about radical Islamists taking innocent people hostage and cutting their heads off on video I console myself in the thought that we are morally superior to that and would never stoop to such grusome and barbaric behavior. But then I read something like this and I have to wonder if we really deserve to consider ourselves morally superior. The good news here is that the Army did conduct an investigation and seven people have been charged with abusing prisoners in this case. Does that mean everything is fine now and there are no more problems? I don’t know. I don’t understand how something like this could have happened in the first place. Why didn’t anybody stop it when it was happening? Aren’t we supposed to be the good guys here? Did 9/11 somehow give us the right to go around the world torturing people? Nobody deserves this kind of treatment ever, not even Osama bin Laden himself. It is morally repugnant and should be beneath us as a civilized nation. The story goes on to say that many of the interrogators who were responsible for these atrocities went on later to work their craft at Abu Gharib. It seems incredible that we are having an argument about Koran desecration these past few days, as if the guards and interrogators involved in these crimes would have thought twice about it. I know that many people will object to this story because it makes our military look bad and hurts morale. They may even deny the reports like they did with the Abu Gharib abuses - up until the point where those infamous pictures surfaced. But I think it is important that we be made fully aware of what happened. We need to have our collective noses rubbed in this or surely it will happen again and again. This wasn’t just a case of a few bad apples. It could have happened with anybody in that position and that is the scariest part. We lost part of our souls after 9/11 and we desperately need to regain it. You don’t get it back by seeking vengeance - this is what the radical Islamists preach. You get it back by taking the other route toward forgiveness and mercy. My friend Robert at Beginner's Mind had an interesting visitor the other night. 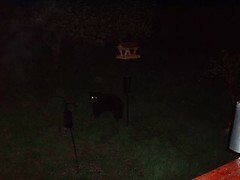 It seems a hungry bear wandered up to his back porch (he lives in Vermont) and started snacking on his bird feeders. I think he needs to just break down and put out a couple of bear feeders. My friend Alamo City Commando has launched a new local blog called All Things Conservative where he promises to discuss all the hot topics of the day and foster intelligent debate between the left and the right. I'm sure the name is meant to be a nice homage to the best news program on the radio. Commando has also taken this occasion to reveal his true identity! Check it out! The Republican hegemony in Washington depends on bending, breaking and ignoring rules that have bound our democracy together these many years. House Majority Leader Tom DeLay is a prime example of someone who sees rules as being non-binding when it comes to asserting his own authority. Now the Republicans in the Senate are preparing to break the rules there in order to give President Bush an unprecedented 100 percent approval of all his judicial nominees. I mean, why settle for just 95 percent when you can break the rules and get whatever you want? The debate revolves around three related provisions: the Constitution's advice and consent clause, the congressional rules clause, and Senate Rule V.
Article II, Section 2, of the Constitution says in part that the president shall have the power to nominate and appoint judges "by and with the advice and consent" of the Senate. While the same clause requires a two-thirds Senate vote to ratify treaties, it sets no specific requirement for judicial confirmation. That suggests that it takes a simple majority of 51 votes to confirm a judge, which has been the historic practice. But some legal analysts say that nothing in the Constitution prevents the Senate from setting a higher standard. The Constitution also says in Article I, Section 5: "Each House [of Congress] may determine the rules of its proceedings." Senate rules permit members to engage in filibusters to stall judicial confirmation votes. Under Senate Rule XXII, even though only 51 votes are needed to confirm a nominee, it takes at least 60 votes to end a filibuster. In addition, the rule says any attempt to change a Senate rule requires the support of two-thirds of the senators "present and voting" (67 votes if all 100 senators are participating). It is those higher vote requirements that are the intended target of the nuclear option. Under that option, the Republicans would use a majority vote (rather than 67 votes) to change the filibuster rule from 60 votes to 51 votes. That would implicate Senate Rule V, which says that the Senate's rules shall continue from one Senate to the next "unless they are changed as provided in these rules." Republicans say the combination of Rule V and open-ended Democratic filibusters of judges can result in unconstitutional entrenchment, rendering Rule V invalid. This is why some Republicans are calling it the "constitutional option." Democrats say the rules are clear and fair, and should not be unilaterally changed in the middle of a heated dispute. So, summing up. The Republicans will disregard Senate Rule XXII and Rule V in order to change Senate rules with a simple majority vote because they think that anything less than 100 percent approval of all Bush judicial nominees is somehow unconstitutional. But the real truth is that they just don’t think rules should ever apply to them. The only gauge that matters in determining how well things are going in Iraq is the one that will determine when we can bring our troops back home. Right now it is not looking so good. American military commanders in Baghdad and Washington gave a sobering new assessment on Wednesday of the war in Iraq, adding to the mood of anxiety that prompted Secretary of State Condoleezza Rice to come to Baghdad last weekend to consult with the new government. In interviews and briefings this week, some of the generals pulled back from recent suggestions, some by the same officers, that positive trends in Iraq could allow a major drawdown in the 138,000 American troops late this year or early in 2006. One officer suggested Wednesday that American military involvement could last "many years." Gen. John P. Abizaid, the top American officer in the Middle East, said in a briefing in Washington that one problem was the disappointing progress in developing Iraqi police units cohesive enough to mount an effective challenge to insurgents and allow American forces to begin stepping back from the fighting. Now all of those shows are defunct with the exception of “ER” which is probably in its next to last season. Since then I’ve become a devoted fan of “Lost” and I may watch the “Friends” spinoff “Joey” on occasion, but not much else has changed. The only new show I’ve heard about that I’m likely to check out next season is the new “Kolchak” series on ABC but I won’t have high hopes for it. I loved the old Kolchak: The Night Stalker series when I was a kid. It was a precursor to X-Files and starred an ink-stained wretch of a reporter who was always in trouble with his editors and the police. I imagine for the new series they will update the character to be a TV news reporter since that is the only kind people are familiar with anymore. But I will reserve judgment until I see it. As for “Judging Amy,” at least this season is on an arc that could make for a good end to the series. They have had some story lines lately that have been irritating like having Amy dump her latest boyfriend (again) after suffering a miscarriage. Amy is currently considering leaving the bench to pursue a U.S. Senate seat. Maybe after the series is cancelled she can make guest appearances on “West Wing.” Also, they may finally let Amy’s mom, played by Tyne Daly, be happy for once and let her get married to the gardener played by Cheech Marin. I really like the characters that Cheech has been playing recently on this show and the old “Nash Bridges” show that I used to watch. Jane Fonda: Banned in Kentucky! The highest grossing film in America right now is Monster-in-Law which I have zero interest in ever seeing. But now it has the distinction of being banned in America - or at least at one theater in Kentucky. Boutwell also banned previous Jane Fonda films, as well as Michael Moore's film, "Fahrenheit 9/11." What a moroon! This guy would fit in well over in China where banning films is practicallly an industry in itself. Bill Moyers has stepped out of retirement briefly to respond to the right-wing campaign to turn PBS into a clone of Fox News. “...news is what people want to keep hidden, and everything else is publicity.... investigative journalism could not be a collaboration between the journalist and the subject. Objectivity was not satisfied by two opposing people offering competing opinions, leaving the viewer to split the difference. I came to believe that objective journalism means describing the object being reported on, including the little fibs and fantasies, as well as the big lie of people in power. In no way – in no way does this permit journalists to make accusations and allegations. It means, instead, making sure that your reporting and your conclusions can be nailed to the post with confirming evidence. Powerful stuff. Worth reading the whole thing. After all the right-wing carping about the United Nations oil for food program, it now looks like the Bush administration was every bit as complicit in providing kickbacks to Saddam Hussein as any of the other nations that have been tarred by this scandal. The United States administration turned a blind eye to extensive sanctions-busting in the prewar sale of Iraqi oil, according to a new Senate investigation. A report released last night by Democratic staff on a Senate investigations committee presents documentary evidence that the Bush administration was made aware of illegal oil sales and kickbacks paid to the Saddam Hussein regime but did nothing to stop them. The scale of the shipments involved dwarfs those previously alleged by the Senate committee against UN staff and European politicians like the British MP, George Galloway, and the former French minister, Charles Pasqua. In fact, the Senate report found that US oil purchases accounted for 52% of the kickbacks paid to the regime in return for sales of cheap oil - more than the rest of the world put together. "The United States was not only aware of Iraqi oil sales which violated UN sanctions and provided the bulk of the illicit money Saddam Hussein obtained from circumventing UN sanctions," the report said. "On occasion, the United States actually facilitated the illicit oil sales. Ever wonder who or what shaped your sense of humor? Not counting family and friends - who would no doubt top the list of everyone’s comic influences - who are the people who most influenced what you find funny today? Everyone has a slightly different sense of humor that is almost as distinct as a fingerprint. What makes some people guffaw at pie-in-the-face slapstick while others quietly smirk at highbrow satire? I’ve compiled a list of the 35 top comic influences on my sense of humor. They are in no particular order other than how quickly they came to mind, which in itself may be some indication. Steve Martin - Before the movies and books and plays and New Yorker essays, I was a big Steve Martin fan having practically memorized his Wild and Crazy Guy comedy album in junior high school. Robin Williams - First there was Mork. Then there was the “Reality... What a Concept” comedy album. He could have stopped there and earned his spot on the list. Richard Pryor - His double album “Wanted - Richard Pryor” was the other comedy record along with the above two that dominated my high school years. Groucho Marx and the Marx Brothers - The Rosetta Stone of comedy in America influencing everyone from Bugs Bunny to Alan Alda’s Hawkeye Pierce character on MASH. Bob Hope and Bing Crosby - The Road pictures established the kind of wry, wink-at-the-camera type of comedy that continues to influence comedy films to this day. Stan Laurel and Oliver Hardy - Classic slapstick by two of the masters of the genre. Woody Allen - I like his early movies best - “Take the Money and Run”, “Bananas”, “Sleeper” but also appreciate his later work. Bugs Bunny and Daffy Duck - My two favorites of the Warner Brothers stable. Donald Duck and Goofy - Ditto with Disney. Charlie Chaplin - I saw “The Gold Rush” as part of a film appreciation class in college and have apprecidated Chaplin ever since. Buster Keaton - The same with “The General”. The Three Stooges - They took slapstick humor to a new level that has never been equalled. Bill Murray, Dan Akroyd, John Belushi, Gilda Radner - The core of the original Saturday Night Live team. Dean Martin and Jerry Lewis - I haven’t seen all of their movies yet but I intend to. George Burns and Gracie Allen - I snag copies of their TV and radio shows at every opportunity. Bud Abbott and Lou Costello - The “Who’s On First” routine would have been enough to merit entry. Bill Cosby - From Fat Albert to the Cosby Show he never stopped being wise and funny. George Carlin - I don’t usually find foul language funny, but when George Carlin compiles a list of the Things You Can’t Say on Television you can’t help but laugh. Johnny Carson and Jay Leno - Their topical late-night routines have defined what is funny for most Americans these past several decades. Billy Crystal - “Running Scared” “When Harry Met Sally” “City Slickers” and his Academy Award hosting all helped cement his place on the list. Jim Carrey - Not always my style of humor, but no denying his vast influence on comedy today. Weird Al Yankovic - The thing I miss most about MTV music videos are his parodies of current hits. In fact, in many cases I enjoy his parody version of songs better than the original. Lucille Ball - I grew up watching her in re-runs. Carol Burnett - The Carol Burnett Show was a staple of my life growing up. Monty Python - See, the British really do have a sense of humor. Benny Hill - And a risque one, at that. Tim Conway and Don Knotts - I wish they had done more Apple Dumpling Gang-type movies together. Cheech Marin and Tommy Chong - Comic geniuses of the stoned age. Peter Sellers - Pink Panther and Dr. Strangelove - quite a career span. Red Skelton - Set the standard for comedy shows on television. The Smothers Brothers - Yo-Yo Man! Mel Brooks - “Blazing Saddles” is one of the funniest films of all-time. Mark Harden suggests I consider adding Andy Kaufman. I do not disagree. Although I was not a regular viewer of Taxi in its hey day, I have seen enough to know that Kaufman was a major talent behind the scenes. And let’s not forget Jim Henson and Frank Oz, the creators of Sesame Street and The Muppet Show. D’Oh! I almost forgot The Simpsons!